I had never experienced such strong springs before. I wasn’t sure if I needed to modify what I knew, or if I needed to work on my own form to be able to execute the exercises on this new equipment. Lucky for me, one of the Pilates teachers who had been hired at the same time as me was a classically trained teacher who had trained on Gratz apparatus. She gave me my first classical Pilates lesson, and I had NEVER before sweated while doing Pilates! This opened my eyes to a new way to look at Pilates and experience it, and I wanted to learn more about the original method. I began to read up about classical Pilates and became a member of Pilatesology, just to be able to watch and do workouts on this foreign apparatus. The exercises looked recognizable although there were what at first I thought were small nuances. While some of the exercises may have looked similar, they did not feel the same at all. I decided to train and certify in the classical system of Pilates and began to practice their specific order of exercises on the mat and Reformer. I then auditioned for Brooke Siler’s teacher training program at her NYC studio re: Ab Pilates. Fortunately for me I was accepted into her program. Little did I know then just how important Brooke Siler was to the Pilates industry, and the influence she would have over me for years to come, not just during my apprenticeship with her. I began the program in the fall of 2013 and traveled to NY from Toronto for the weekend seminars, making my trips longer than the required days so that I could spend days at the studio observing her and her teachers leading private lessons. Other than Brooke, my other favorite teacher to observe, who also presented the work to us during the seminars, was 2nd generation teacher Carry Regan. I learned so much from watching these amazing teachers. The energy in the studio was palpable. Students of Pilates were truly working hard and sweating, breathing and wringing out their bodies. This was so unlike what I had observed and experienced previously in Toronto, where Pilates seemed more akin to physical therapy than a workout. I was hooked. And I became transformed, both in how I moved physically, and in my way of thinking about movement and how to approach my clients’ needs. After 18 months, I graduated in the spring of 2014. By this point Brooke had already decided to close her studio on Bleeker Street and was teaching out of what was then Pilates Challenge on the Upper East Side (and is now a Real Pilates studio). Brooke was transitioning to move from NY to England, and I was the very last apprentice she tested out and certified before embarking on her new life in the UK. For some reason, that means a lot to me. I am forever indebted to Brooke. She was (and continues to be) the perfect mentor: kind, supportive, positive but firm in what constitutes good movement and what is not, and one of her signature characteristics, her hands-on teaching and cues have shaped me (literally) into the teacher I am today. That same year, I opened my very own studio in Toronto, a small 500 square foot walk-up that featured one Reformer, one Cadillac, one Wunda Chair, one Ladder Barrel, one Baby Barrel, one Spine Corrector, and four traditional folding mats, all by Gratz. My studio would be Toronto’s first classical Pilates studio. While Equinox Bay Street did feature Gratz apparatus, none of the teachers that worked there were classical (by that time my dear friend Suny Samson, the teacher who gave me my first classical Plates lesson, had left Toronto and moved to Vancouver, British Columbia in Canada). I operated my studio between the hours of 9 a.m. and 3 p.m. while my kids were in school, and I only saw private clients. Eventually I brought in small group mat classes for up to 5 people, 4 of them on the folding mats and the 5th person on the Cadillac. These became very popular. I also brought in a teacher I had met recently who was a Romana’s Pilates certified teacher. She worked full time in a gym downtown that was equipped with Stott Pilates machines, but came in one evening a week to see a private client and to offer a mat group class. I recall bringing in Peter Fiasca for a workshop back in the spring of 2014. He was wonderful! Sam and Susannah Cotrone also paid me a visit while in Toronto with family, and offered private lessons out of my studio for a day. That was a lot of fun! Benjamin Degenhardt flew in to offer a 2-day mat workshop at my studio and we had 14 people in attendance. That was super exciting and drew teachers from contemporary backgrounds willing to explore the traditional mat system. By the summer of 2015 I had outgrown my original small studio and we moved to a slightly bigger space that afforded us the ability to have 2 rooms being used at the same time: one in which 4 Wall Unit towers and mats could be used for group mat/tower classes, while at the same time 2 people could be having private or semi private lessons on reformers and ladder barrels in the other room. My staff had also grown from 2 people to 4, with one American teacher and one Italian teacher, both classically trained and living in Toronto at the time. The next year saw us experience explosive growth in clients. Chris Robinson came to offer two workshops during this time, and again many teachers with contemporary backgrounds attended. In the summer of 2016 the commercial space below my studio became available and my husband and I decided to expand, adding 2 more floors and 2000 square feet more of space to our existing size. Much more apparatus was ordered. We now have all the pieces Gratz makes including a Guillotine tower (it was the first in Canada!). I also completed a 9 month intensive program for certified teachers with Chris Robinson at his studio S6 Fitness in San Diego (he has since relocated to Dallas – is there something about me enrolling in teacher’s programs that makes my mentors relocate?! Ha ha). I have been so fortunate to learn from such amazing teachers. My greatest passion is becoming a mentor to others and helping to shape future teachers. I want to pass on what’s been handed down to me and ensure I am not the end of the line in Toronto when it comes to preserving the original system Joseph Pilates created. I launched my Teacher Training certification program in March 2018 with 8 apprentices. I dedicated so much time to writing my manuals and photographing the exercises and it felt so rewarding to see this group come together and embrace the work. Chris Robinson was so supportive in offering to travel to Toronto for the seminar weekends and assist me in presenting the exercises. Each week I spend countless hours mentoring them individually and collectively and I am so proud of their growth. They have gone from clients, to students to teachers and many are starting to work in my studio as they complete the last leg of their apprenticeship and prepare to test out. The next group of apprentices is already starting to come together and I will lead this next round in May 2019. I look back fondly and proudly on how far classical Pilates and I have come in Toronto over the past 5 years. 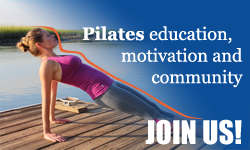 It is my sincere hope more teachers in Toronto who come from contemporary backgrounds will become curious about the origins of Pilates and discover it and embrace it. How proud would Joseph Pilates be of those whose work bears his name to remain true to his intention and design! Lili Viola has been a Pilates teacher for the past 15 years. Her first certification was through Stott Pilates, a contemporary derivative of the traditional system. In 2013 she was introduced to Classical Pilates and instantly felt the difference. She apprenticed with Brooke Siler and became a 3rd Generation Certified Authentic Pilates Teacher. Today Lili owns Lily Viola Pilates, a classical Pilates studio fully equipped with Gratz apparatus that spans 3 floors. When not at the studio, Lili enjoys spending time with her husband, three kids, and dog. She loves to travel and experience the great outdoors.